Yes—but it needs to be popular to become a mass movement. Who thinks Ivanka Trump is a feminist? Seriously, who? As far as I can tell, the only people calling her a feminist are Ivanka herself and conservatives who use her to attack real feminists as a pack of radical banshees. What there are a lot of, though, are articles by feminists explaining why Ivanka is not a feminist to the unnamed people out there who supposedly think she is one. Well, OK, message received. Women do need sweeping societal change. But “liberal feminism” has plenty to offer to the nonelite. Not so long ago, feminism was said to be enjoying a moment: think grassroots groups like Shout Your Abortion, pop-culture icons like Beyoncé and Lena Dunham, Hillary Clinton’s presidential campaign. But popularity bred contempt. Feminism, went the critique, had become too inclusive—too consumerist, corporate, individualist, and superficial. From being a label no one wanted to wear, it had become a label that could be claimed by anyone—and used to sell anything, to the great benefit of the real enemy, capitalism. Jessa Crispin’s just-published manifesto, Why I Am Not a Feminist, is a particularly sweeping rendition of this line of thinking. (“My feminism is not one of incremental change, revealed in the end to be The Same as Ever, But More So. It is a cleansing fire.” Etc.) So too is the demonization of “liberal feminism” as incarnated in Hillary Clinton, which one can find all over the left (even in liberal magazines like the New Republic, where Crispin blames Trump’s election on Hillary being the Wrong Kind of Feminist—because the evangelical Christians and Republican white women who voted for him are just waiting for that cleansing fire, and the nearly 3 million votes that gave Clinton the popular-vote margin only prove how fraudulent her feminism is). There’s some truth to these critiques. A movement to fundamentally change society has to have more grit and content and analysis than “You go, girlfriend!” I don’t think one can be a feminist and oppose legal abortion, for example, because that means you think a woman is basically, as an Oklahoma politician recently put it, a potential “host” for a fertilized egg—a view that is incompatible with women’s human rights. At the same time, a movement that claims to represent the interests of half the people in the world has to have broader appeal than one is likely to find in the pages of Jacobin or The Nation. The pop-feminist website Jezebel has probably introduced more young women to feminism than anything since The Feminine Mystique (another work now criticized as bourgeois and individualist, although it was written by a woman who was close to the Communist Party). Hillary Clinton’s platform was a cornucopia of proposals aimed at low- and middle-income women, from higher wages to free college. I’m not very interested in pop culture myself, but if Beyoncé wants to identify as a feminist, and if Chimamanda Ngozi Adichie, the world-renowned Nigerian novelist, gives a TED Talk called “We Should All Be Feminists” and Beyoncé samples it, isn’t that a good thing? We don’t want to be like the cashier at Barnes & Noble who looked down his nose at me as he rang up my copy of Game of Thrones, because I’d found out about the books through the TV series, and he’d been reading George R.R. Martin for years. But even if you dismiss pop feminism, it’s not the same as so-called “liberal feminism,” which is often depicted as “empowerment”—not liberation—for privileged ladies only. Glass ceilings, glass cliffs, leaning in: This is the feminism, we’re told, that offers nothing to the mass of American women, most of whom are mothers struggling to get by on pink-collar and lower-level white-collar jobs. There’s some truth to that, too: A lot of women are in crisis and can’t be expected to cheer when a female executive gets a promotion at Apple. Women do need sweeping change throughout society. But does the “liberal feminist” agenda offer nothing to the nonelite? Its docket includes pregnancy- and job-discrimination cases up and down the income scale, from academia to UPS—to say nothing of reproductive rights, no-co-pay birth control, violence against women, equal access to sports programs in school, LGBTQ rights, and many other issues that matter to all women. In recent years, those pesky liberal feminists have actually made significant progress in policies that benefit women economically. In 2016, New York became the fifth state to pass a paid-family-leave law, and it will also raise the minimum wage for all workers to $12.50 in 2021. New York City Mayor Bill de Blasio has instituted paid sick days as well as universal pre-K and a $15-an-hour minimum wage for city workers. President Obama mandated paid family leave for federal employees; Democratic women in Congress have proposed a federal paid-leave law and the abolition of the Hyde Amendment restricting abortion funding. Hillary Clinton’s platform was a cornucopia of proposals aimed at low- and middle-income women, from higher wages for day-care workers—currently outrageously underpaid—to free community college. Even supervillain Sheryl Sandberg understands that women need more than pluck and ambition: At Facebook, she’s instituted a $15 wage for contractors, a minimum of 15 paid days off, and a $4,000 new-child bonus for both parents; she’s also called for federal paid parental leave. There’s a lot of room between celebrating Ivanka’s little pink dresses and excluding everyone who doesn’t call for communism this afternoon. In recent years, feminism has actually become broader and deeper: Reproductive justice, which centers low-income women of color, is replacing choice as the framework for reproductive rights, to choose just one example. 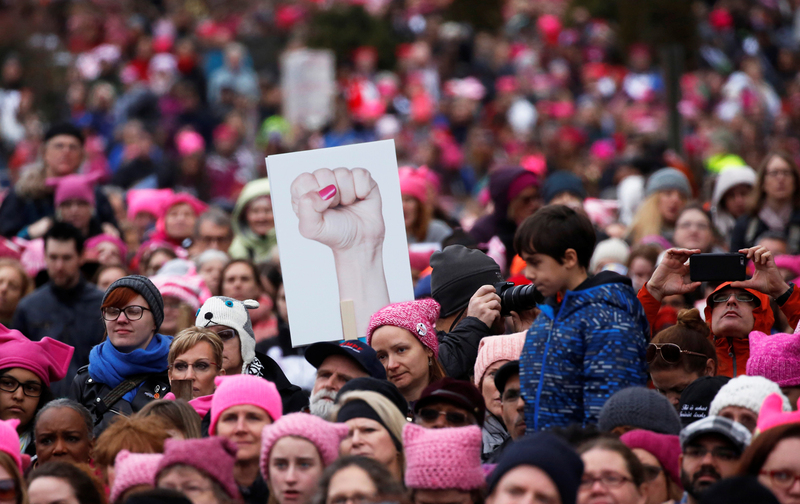 The Women’s March found room for a broad array of women, from Muslim women to trans women to women of all races, holding signs for Black Lives Matter. It wasn’t feel-good feminism—but it did feel good.